20 studio albums, and more than 33 million albums sold worldwide since 1968. That is a very short description of progressive symphonic rock band YES. Today the band consists of the perennial bass player Chris Squire, plus well-travelled guitarist Steve Howe, drummer Alan White, who´s been around since album number five, Geoff Downes, who´s more famous as a member of ASIA, and new boy Benoit David, who was brought in to replace the ill Jon Anderson in time for the reunion in 2008. For this album the band has rejoined forces with Grammy Award winning producer Trevor Horn, who also helped out with songwriting and added the aid of ASIA keyboardist Geoff Downes for the benefit of the album. Is the music all that good? Being a progressive symphonic rock band of old foxes they of cause have a song in parts, the title track. 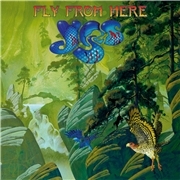 The single track “Fly From Here – We Can Fly” is the standout part, a typical result of pros at work. There is a 60´s touch, but it is all clad in a quite modern dress. That is not always the case here, but it becomes an ageing band of this caliber. No one really expects this lot to release something influenced by KORN – right? Album closer “Into the Storm” is another standout track, a little bit faster than the rest, while still gentle. There is no crash and burn song here, as could be expected. The most anonymous case is the acoustic and almost bard material “Solitaire”, but it is still proof of the mighty Steve Howe at work. Another favorite is “Life on a Film Set”, an almost pop-like piece, but still with a typical YES-filter applied. Anyway, with one or two more really appealing song this would have been a standout album of 2011.